June 18, 2017 by Brunete F.
Hand-blown glass in a mold formed in Portugal creates a petite piece for holding your favorite liquor. 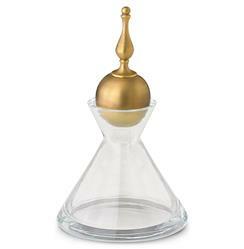 Matte-finished brass cast in India tops this eclectic decanter in shimmering style. The gilded stopper graces an hourglass base with a glimpse of Global Bazaar.